1.Locate the scheduled task in either the SPM Calendar or the Scheduled Tasks sub-tab from the main SPM screen, then double-click the task to open the Task Editor. 2.Click the Samples tab and highlight the desired samples, then click Copy > To Another Task. 3.Select the destination task(s), and check to remove the exported samples from the source task. a.If Remove samples from the source task is checked, a second box appears with the option to Preserve sample codes. 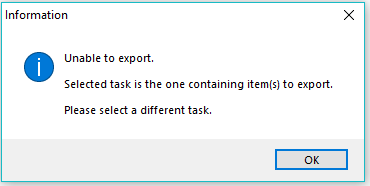 4.Click Export, then confirm Yes or No. 5.An information window will appear with any issues detected, or will say "Export operation finished." 6.Click OK, then the source task will be shown. Exported items will be removed (if option was selected). 7.Click OK to close the window. 2.Click the Activities tab and highlight the desired activities, then click Copy To Another Task. 3.Select the destination task(s), and check to remove the exported activities from the source task.